The economic effect of low oil prices is a hot topic in oil-producing states like North Dakota. 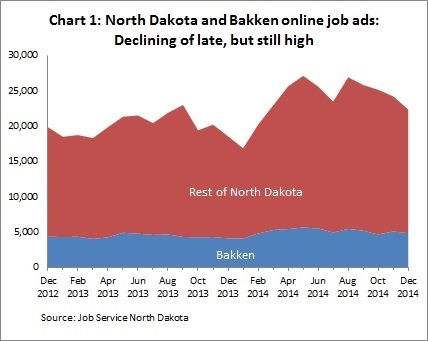 While many fear a big slowdown in the Peace Garden State, so far it’s not showing up in online job ads, according to the most recent figures published by Job Service North Dakota. December online job ads showed a couple of interesting twists. First, while overall ads declined steadily in recent months, they were nonetheless 21 percent higher on a year-over-year basis (see Chart 1). Similar to 2013, a seasonal decline can be seen in the last half of 2014. Job openings in the energy production counties of the Bakken followed a similar trend, with a decline from August to December, yet December’s online job total was 18 percent higher than a year earlier. Despite continued strong job demand overall, some shifts in advertised jobs at the state level align with the notion of slower oil activity. For example, job ads in the construction and extraction sector grew less than 1 percent over the previous 12 months (see Chart 2). Meanwhile, health care, food service, management, and architecture and engineering increased more than 30 percent. On the other end, production job postings decreased about 10 percent. It’s difficult to say how these sector changes played out geographically (county level data were not available for job sectors). Some of this shift is likely driven by growth in health care and other professional jobs in the state’s metro counties, especially Fargo’s Cass County, which saw online job postings increase by 40 percent over the past 12 months. 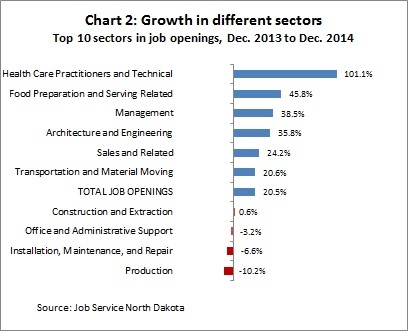 There might also be transitional shifts in Bakken counties as communities there grow.